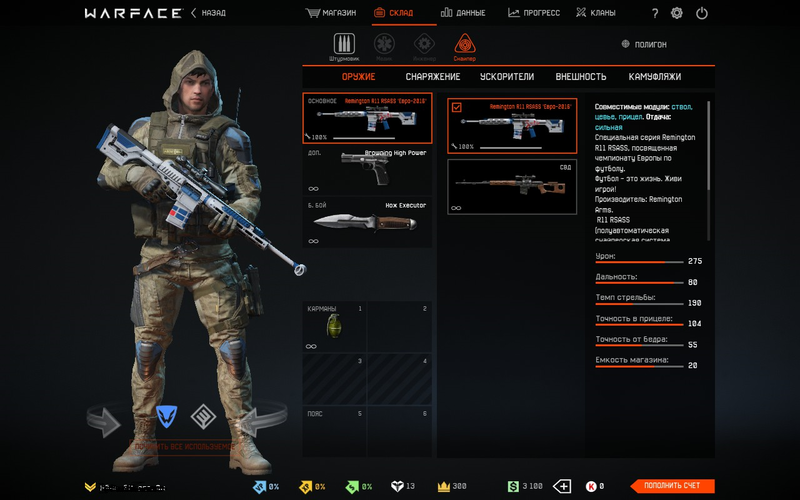 Selling an excellent account for the warface initial 8 rank server charlie with a rare Donat "Euro-2016" !!! sniper - Remington R11 RSASS "Euro-2016"
There are no phone bindings, there are no interest-free loans! A clean account, there is a letter of registration at the post office. 1. After payment, no return or exchange of goods is possible. 2. You should realize that this is a virtual value and after its receipt, a refund of funds and value is not possible. 1. This product is either taken for sale, and has been under market control for a long time, after which it is put up for sale. Or the value is bought by the market and put up for sale. 2. All values ​​/ goods / accounts / characters undergo a detailed market check, each seller values ​​a scan of the passport and all the requisites for communication. By the time of sale, the product under the control of the market is more than 30 days. The whole month the values ​​are tested. 1. Data from the game. 2. Data from the mail. 3. Brief information about the account. 4. Full control over the value.